Metaphorical thinking — our instinct not just for describing but for comprehending one thing in terms of another, for equating I with an other — shapes our view of the world and is essential to how we communicate, learn, discover and invent. 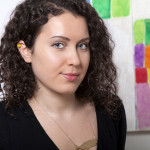 Brain Pickings founder and author, Maria Popova, discusses how children have an instinctive metaphor-making ability. “Children help us to mediate between the ideal and the real,” MoMA’s Juliet Kinchin wrote in her fascinating design history of childhood. Indeed, children have a penchant for disarming clarityand experience reality in ways profoundly different from adults, in the process illuminating the workings of our own minds. But among the most curious of these mediations of reality is children’s understanding of abstraction in language, which is precisely what James Geary explores in a chapter of his altogether enthralling I Is an Other: The Secret Life of Metaphor and How It Shapes the Way We See the World (public library). Yet metaphor is much, much more than this. 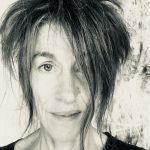 Metaphor is not just confined to art and literature but is at work in all fields of human endeavor, from economics and advertising, to politics and business, to science and psychology. … There is no aspect of our experience not molded in some way by metaphor’s almost imperceptible touch. Once you twig to metaphor’s modus operandi, you’ll find its fingerprints on absolutely everything. Metaphorical thinking — our instinct not just for describing but for comprehending one thing in terms of another, for equating I with an other — shapes our view of the world, and is essential to how we communicate, learn, discover, and invent. Metaphor is a way of thought long before it is a way with words. Children share with bonobos an instinctive metaphor-making ability. … Most early childhood metaphors are simple noun-noun substitutions… These metaphors tend to emerge first during pretend play, when children are between the ages of twelve and twenty-four months. As psychologist Alan Leslie proposed in his theory of mind, children at this age start to create metarepresentations through which they imaginatively manipulate both the objects around them and their ideas about those objects. At this stage, metaphor is, literally, child’s play. During pretend play, children effortlessly describe objects as other objects and then use them as such. A comb becomes a centipede; cornflakes become freckles; a crust of bread becomes a curb. Researchers asked the children to act out the stories using a doll. Five- to six-year-olds tended to move the Sally doll through the air when the last sentence was “Sally was a bird flying to her nest,” taking the phrase literally. Eight- to nine-year-olds, however, tended to move her quickly across the ground, taking the phrase metaphorically. 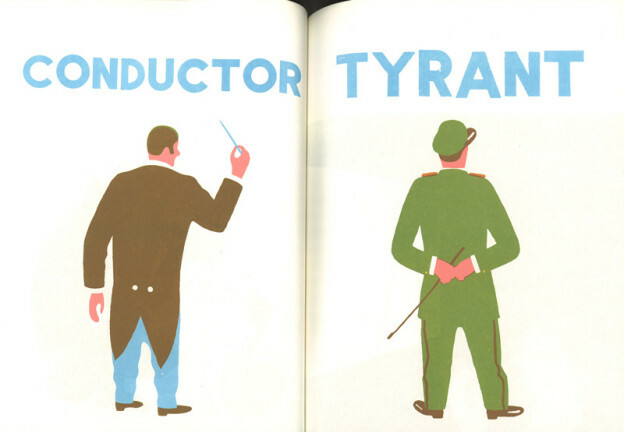 In his brilliant picture-book ‘People,’ French illustrator Blexbolex uses visual, perceptual similarities to make clever commentary on conceptual ideas. Click image for details. To trace the development of double function terms in children, Asch and Nerlove presented groups of kids with a collection of different objects — ice water, sugar cubes, powder puffs — and asked them to identify the ones that were cold, sweet, or soft. This, of course, they were easily able to do. Asch and Nerlove then asked the children, Can a person be cold? Can a person be sweet? Can a person be soft? While preschoolers understood the literal physical references, they did not understand the metaphorical psychological references. They described cold people as those not dressed warmly; hard people were those with firm muscles. One preschooler described his mother as “sweet” but only because she cooked sweet things, not because she was nice. Asch and Nerlove observed that only between the ages of seven and ten did children begin to understand the psychological meanings of these descriptions. Some seven- and eight-year-olds said that hard people are tough, bright people are cheerful, and crooked people do bad things. But only some of the eleven- and twelve-year-olds were able to actually describe the metaphorical link between the physical condition and the psychological state. Some nine- and ten-year-olds, for instance, were able to explain that both the sun and bright people “beamed.” Children’s metaphorical competence, it seems, is limited to basic perceptual metaphors, at least until early adolescence. Children have trouble understanding more sophisticated metaphors because they have not yet had the life experiences needed to acquire the relevant cache of associated commonplaces. [Gentner] presented three different age groups — five- to six-year-olds, nine- to ten-year-olds, and college students — with three different kinds of similes. Attributional similes, such as “Pancakes are like nickels,” were based on physical similarities; both are round and flat. Relational similes, such as “A roof is like a hat,” were based on functional similarity; both sit on top of something to protect it. Double similes, such as “Plant stems are like drinking straws,” were based on physical as well as functional similarities; both are long and cylindrical and both bring liquid from below to nourish a living thing. Gentner found that youngsters in all age groups had no problem comprehending the attributional similes. But only the older kids understood the relational and double similes. In subsequent research, Gentner has found that giving young children additional context enhances their ability to pick up on the kind of relational comparisons characteristic of more complex metaphors. 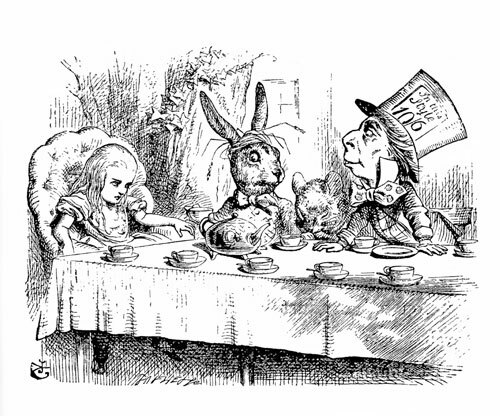 Some of history’s most celebrated children’s books, like Alice’s Adventures in Wonderland, are woven of metaphors exploring life’s complexities. Click for more. Any metaphor is comprehensible only to the extent that the domains from which it is drawn are familiar. This is one of the marvels of metaphor. Fresh, successful metaphors do not depend on conventional pre-existing associations. Instead, they highlight novel, unexpected similarities not particularly characteristic of either the source or the target — at least until the metaphor itself points them out. 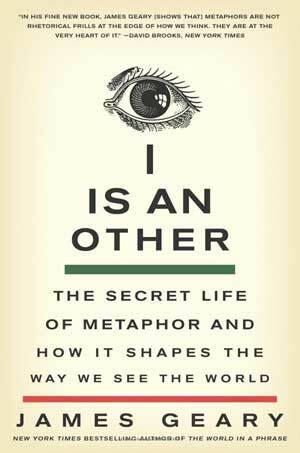 I Is an Other is endlessly illuminating in its entirety, exploring how metaphors influence our experience and understanding of everything from politics to science to money. It follows Geary’s equally fascinating The World in a Phrase: A History of Aphorisms and Geary’s Guide to the World’s Great Aphorists.